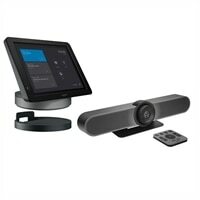 Logitech Smartdock Meet Up Camera Huddle Room With Flex Package For Skype RoomSmartDock, a purpose-built AV control console delivers convenience for meeting organizers and peace of mind for IT. SmartDock Flex simplifies cabling between the conference table and the front of the room while AV Passthrough allows for meetings outside the Microsoft ecosystem. The MeetUp conference camera further improves the video conferencing experience with a super-wide 120-degree field of view, pan/tilt lens, Ultra 4K optics, and 3 camera presets. MeetUp's integrated audio is optimized for huddle rooms. Three beamforming mics and a custom tuned speaker ensure everyone can be seen and heard. SmartDock, a purpose-built AV control console delivers convenience for meeting organizers and peace of mind for IT. SmartDock Flex simplifies cabling between the conference table and the front of the room while AV Passthrough allows for meetings outside the Microsoft ecosystem.